Warning! I give lots of unsolicited advice in this article — unsolicited, unprofessional, inexpert, etc. I am in no way a trained psychologist. All I’m doing is relating my own experience; so proceed at your own risk. Fear, anger, worry, jealousy… These are some of the nastiest things we deal with in life. Why? Where do they come from? What are they for? And what can we do about it? I don’t know where they come from, but I think they come from the feeling that you are separate from Other Things in the world, and that these Other Things can reach out and affect you in ways you won’t like — hurting you, changing you, killing you. It would be nice. Fear and the other negative emotions are terribly unpleasant. In a very real way, they remove us from the world, and force us into a kind of shadow-world, where the colors are dimmed, and sounds are muffled. Instead of living here in the present, fear and worry focus our attention on the unformed future, or the regrets of the past; and so we don’t pay as much attention to the marvelous colors and sounds of the Earth, and we live a sort of stunted half-life. How Can We Be Free From Fear? Is it possible to suppress fear — to turn away from it, and just try to think about something else? To willfully turn it off? Subjects who were asked specifically not to think of a green rabbit, but to nevertheless ring a bell whenever they thought of it, generally rang the bell five times in the next six minutes. And the effect seems to be the same regardless of whether they were thinking of something important or unimportant, or were asked to ring the bell or just report their thoughts afterwards. Even trying to think of something else had mixed results at best. Subjects were told something like, “Don’t think of a green rabbit. Instead, think of a blue squirrel.” The result? Whenever people thought of the blue squirrel, they would automatically think of the green rabbit. And yet… it is possible to turn away from thoughts, to willfully focus your attention on whatever you want. This is basically what meditation is, after all: willfully focused attention. It’s not easy at first; it certainly takes practice. But once you’re good at it, you can direct your thoughts toward or away from things easily. I strongly suspect that if these psychology experiments had been performed on people skilled at meditation, the results would have been vastly different. So, with practice, can you suppress fear by simply ignoring it? Well, yes and no. The word suppression is a tricky thing. Let me give an example. If I perform visualization meditations when I am particularly tired or feeling a bit down, I frequently encounter nasty things — unpleasant beasts, rude people, even monsters and skeletons and such. These beings say awful things, things that seem almost designed to elicit fear — “I am your Dark Side”, “I am your Future”, or “I am a Spirit that is Haunting You!” If I try to walk away or ignore them, they will change form, becoming even more horrible or nightmarish, as if they are trying to keep my attention. But they are actually easy to dispel. All I have to do is turn firmly away, and focus on cheerful things — bright light, melodious sound, colors, feelings, etc. — and they are gone. They cannot grab my attention. They can only have my attention if I give it to them. So, where do they go when I ignore them? Are they “suppressed”? I don’t think so. I believe they are created by my own negative or confused feelings, and when I turn my attention away from those feelings, the feelings and the negative beings disappear entirely. Think of a musical instrument. You may play a sad melody on it. If you then stop, and start playing a happy melody, are you “suppressing” the sad melody? Of course not; you’ve ended it entirely. Naturally you can turn your attention to it again, and bring it back. But the sad song isn’t hanging around somewhere hoping to get played again. Emotions do not have an existence independent of our attention. They can be released; and then they are well and truly gone. Unless Spirit brings them back. Sometimes a valuable lesson comes cloaked in fear or pain. I don’t think Spirit prefers to serve us our lessons in this way, but perhaps we don’t always give Spirit a choice. Spirit may need us to learn a lesson about compassion, or joy, or oneness; but if we see this lesson as a threat to our identity, it can be a fearful experience. In this case, you can turn your attention away, but Spirit will keep trying to teach you the lesson until you get it. The best thing to do is face the lesson head-on. If Spirit keeps bringing it back, then you have to face it. But it doesn’t have to be fearful. Like anything else, fear can be ended by removing what’s causing it. Take the obvious cases first. If someone is generating fear in you by running at you with a knife, one way you can eliminate the fear is by somehow stopping them from doing that — by calling out to a friend, pointing your gun at them, running away very fast, etc. But sometimes that kind of option isn’t open to you. In this case, you have to find a deeper cause for the fear. Are you afraid of a knife? Actually, you’re not — it’s pain and death you’re really afraid of. If you could eliminate those fears, then a knife wouldn’t upset you at all. The knife is just a proximate cause; fear of pain and death is the ultimate cause. But pain and death don’t necessarily cause fear. People can face pain and death without fear. What really causes fear, I think, is the feeling of being separate from Other Things, as I mentioned at the beginning. These Other Things might have power over you, might change you or kill you. Best avoid them! Especially if they’re sharp. But these Other Things… Are they really Other? Are they really separate? I don’t think so. In meditation, digging around in the subconscious mind, I’ve found that there isn’t really a boundary between Me and Other-People. There are some parts that are definitely Me, and some parts that are definitely Others, but they sort of merge into each other; there is no boundary, any more than there is a boundary between my hand and my face. And these Other Things… Can they really harm you? Do they really have power over you? Your physical body can be destroyed without your explicit permission. But the true essence of you — your own soul — need not be touched. Imagine the worst possible outcome. Think about what that would mean. When you do that, remember that you are an eternal being, an extension of the universal soul. From this broadest perspective, the worst possible outcome never looks quite so horrible. Then the fear is gone. You are no longer imprisoned in the future, locked into worry. The world explodes into color. And you feel more alive than ever. I like the the Dalai Lama quote. Recognise the emotion, reflect upon how the are affecting you, etc, accept it and move on. I’ve been doing a little bit of preliminary research into Insight Meditation (Vipassana) to see if it would be worth adding to my other mediational practices. 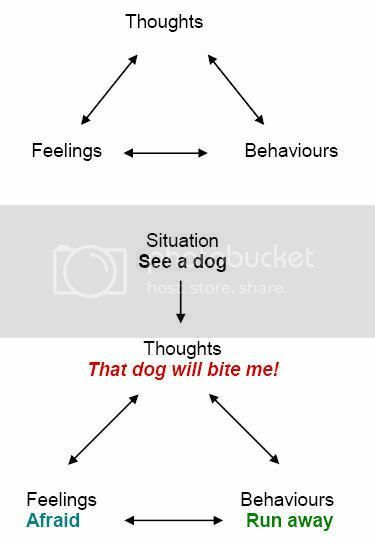 I’ve been reading up on Cognitive Behavioural Therapy and practising some of the techniques. I really need to do them more often. And these Other Thingsâ€¦ Can they really harm you? Do they really have power over you? While I would have to say that my anxious thoughts have power over me, in most instances there really isn’t anything to fear, but it’s a thinking-trap not easily overcome. But Mahud, I’m not sure I would deliberately seek out situations that produce anxiety. I’m not convinced that it’s the only way — or even the best way — to overcome these problems. As I hate the exposure element of CBT, if there’s an alternative I’d very much like to hear what it is. Jeff, I just downloaded the Athanaeum and paid what was asked–it happened to be just about what I was thinking of paying anyway. But I didn’t see any way to change the amount. If I’m feeling poorer or more generous in the future, how would I be able to do that? P.S. It’s so weird to me to think of a newsletter as an “Athanaeum”–my college (from which I graduated this past May) has had a multi-year project going on called the Athanaeum, but it’s a new library! Hi Clare! Thanks so much for your download & donation! I hope you really enjoy it. You should be able to change the amount by just clicking in the box and editing the total. I have tried it before and had no trouble. Let me know if that doesn’t work for you. Well, would you look at that… it looks different this time. Huh. I don’t expect to have trouble in the future! Great article Jeff. I read it with interest. I went through some nasty spells in my life and had to deal with these emotions so I’ve thought a lot about them. My therapist in the early 90s thought it was silly to think “happy thoughts” like some people say. She suggested focusing instead of things like motes of dust hanging in the air, to pull your mind away from dark thoughts. She told me I had very good coping skills. In fact, she thought they were a little too good. But they got me through. I don’t, at least to my way of thinking, “suppress” unpleasant thoughts/images, but I distract myself away from them by putting my thoughts elsewhere, or by thinking about other things. At that point, when fear could have crippled me, I realized I had no time for it. I had to do something. So the funny thing was for me, when things seemed bad but weren’t truly bad, there was time for fear and anger and other negative emotions. It was all too easy at times to dwell on them. But that was because I had the luxury to dwell on them. When the chips were down, I didn’t. During that time, I hardly ever thought about how bad things were. I didn’t suffer any depression. I didn’t have time. All my energy went to staying alive, getting a job, walking 2 or more miles to work, spending hours each day on busses, getting a bike, slowly improving my life, but mostly just staying alive. I’d come home exhausted and go to sleep. That episode really put things in perspective for me. The only fear that really gnaws at me still is the fear of getting old enough that I can’t function anymore. But then there’s always distraction. Hrafnkell, thanks for the inspiring comment! I’ve never been anywhere near as low as that; but if I ever am, I hope I have the guts and the poise to handle it like you did. Blessings on you! I like the example you use about the knife-wielding attacker. Our habitual response to a situation is to be afraid, for the very reasons you mention. But when you imagine yourself in that situation, and then also imagine that you have nothing at all to lose… it becomes entirely possible to pull on an enormous amount of power and strength from within and respond differently. For example standing firm and grunting from the very depths of your being, projecting as much energy forward and out as you can. Most knife wielding attackers suffer from the same fears as we do, and the sight of someone responding in an unexpected way is enough to throw them off completely. Now I haven’t tested this… it’s all theory… I’m just going by ‘thought-experiments’, and musing over possibilities. But in my thought experiments, the way I feel as the “victim” completely changes when I refuse to BE the victim – when I have nothing left to lose and choose my response. I have however played with this concept of altering emotional states within arguments with loved ones. During an argument, when feeling afraid and freaked out and sad etc, I’ve noticed my emotional state, noticed it was based on fear of loss, and taken a moment to let go of the fear, to breathe, and then to pull out my strength and completely change the emotional resonance of my being within the argument. The results are extraordinary. As soon as I change, the other person changes and the argument often fades away into nothing-ness. Hmmm… you’ve got me thinking Jeff! Great Post! If you read an article of mine in Athenaeum 2008:Z (“Mapping the Subconscious”), it really does seem as though the areas of ourselves that are more fear-centered and low-vibration are the same ones that are less connected, less integrated, more ego-centered.